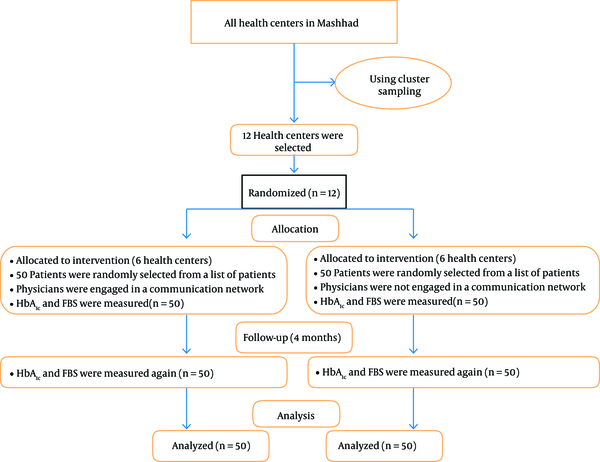 To Cite: Vafaei Najar A, Tehrani H, Imamian H, Mohades Hakak H, Vahedian-Shahroodi M. Impact of Establishing a Communication Network of Family Physicians on Level of Hba1c and FBS in Patients With Diabetes: A Randomized Clinical Trial, Iran Red Crescent Med J. 2017 ; 19(11):e14869. doi: 10.5812/ircmj.14869. Background: Diabetes could be especially difficult for females. The burden of diabetes on females is unique because the disease could affect both mothers and their unborn children. Objectives: The aim of this study was to determine the effect of developing a communication network among physicians on the level of HbA1C and Fasting Blood Sugar (FBS) in patients with diabetes in Iran. Methods: This study was a randomized clinical trial performed with 100 patients, who were randomly divided to experimental and control groups. The study was conducted from 20/11/2015 to 15/1/2016. A communication network was established among the physicians at health centers, to which patients in the intervention group were referred. The data were collected using a checklist of demographic information of patients. Laboratory results regarding the level of Glycated Hemoglobin (HbA1C) and Fasting Blood Sugar (FBS) of patients were gathered at baseline and 4 months after the establishment of the communication network. Results: After the development of the communication network, HbA1C levels had reduced from 8.14 ± 2.08 to 7.90 ± 2.01 in the intervention group (P < 0.001), while in the control group HbA1C levels had increased from 8.98 ± 2.20 to 9.09 ± 2.21 (P < 0 .001). Conclusions: The results showed that for successful control of diabetes, physicians need to communicate with each other and share information and experiences. Furthermore, establishing a communication network among physicians could be effective to control diabetes. Today, non-communicable diseases pose the biggest challenge to human health by taking the life of 38 million people annually in the world with almost three-quarters of this mortality (28 million) occurring in low and middle income countries (1). It has been estimated that the number of patients with diabetes is increased with a rate of 4.5% and it is expected to reach more than 330 million people in 2025 (2). The most recent study reported a high prevalence of diabetes in the highly urbanized population of Tehran, Iran’s capital, the country that is the focus of the present article (3, 4). According to previous studies conducted in Iran, the prevalence of type-2 diabetes among adults aged 25 to 64 was 7.7%, and 50% of this amount was new cases of the disease. Moreover, the prevalence of type-2 diabetes has increased by 1.8 times in an 8-year period (5, 6). Diabetes is associated with a host of complications, including increased risk of cardiovascular disease, neuropathy, amputation of legs, retinopathy, risk of blindness, and kidney failure (7, 8). Numerous studies have shown that keeping glycosylated hemoglobin (HbA1C) below 7% would prevent the emergence of diabetes complications in eyes, kidneys, and nerves, and also improve their existing symptoms and hamper their progression (9). According to the guidelines proposed by Iran's Ministry of Health, every patient with diabetes that refer to health centers should be cared by a physician at least once in a three-month (seasonal) period (10). In Iran, a decade of work in the field of evidence-based practices, along with other results, has shown the need for the use and transfer of health knowledge (11). However, the application transfer of diabetes knowledge, as one of the most important subspecialty fields of medicine, is not desirable in Iran (12). A number of different strategies could be used to control blood sugar and manage symptoms. One of the most effective strategies in controlling diabetes is to raise awareness of the patients about this disease. International Diabetes Federation believes that with proper education, diabetic complications could be reduced by up to 80% (13). A study in Australia has shown that diabetes education is the most powerful predictor of glucose and diabetes control as an independent variable (14); however, the complexity and chronic nature of diabetes has posed tremendous challenges to healthcare professionals dealing with patients with diabetes (15, 16). The number and variety of therapeutic interventions for the prevention and control of diabetes and the necessity of observing issues, such as harmful drug interactions and continuous control and adjustment of FBS and glycosylated hemoglobin HbA1C, have complicated diabetes management. Therefore, the acquisition of necessary knowledge and skills by physicians is vital to control and manage diabetes (16, 17). In fact, the competence and qualifications of healthcare workers, including physicians, is pivotal to planning and provision of high-quality care. Thus, it seems essential to make greater investment in enhancing the quality of physician’s training in the control of diabetes (18). It has been suggested in the literature that many physicians are not familiar with clinical guidelines (19). To improve the quality of healthcare in patients with diabetes, as one of the objectives of Iran's comprehensive national program for diabetes control, several strategies have been proposed, including patient education, increased facilities, and establishment of health care centers. A key factor contributing to improved care of patients with diabetes is providing opportunities that promote the performance of physicians for care of patients with diabetes (20). One of such opportunities is the development of a communication network among physicians (21). The ability to communicate with other medical experts is a skill necessary for higher efficacy of medical measures and one of the key elements related to the quality of care and safety of patients (22, 23). A common therapeutic intervention practiced by all medical specialists is the request or provision of consultation as part of their clinical work. To be able to give advice, expertise in specific areas of patient treatment is required (24). The cooperation of health care providers is integral to the treatment of patients. One of the major functions of establishing such a communication network among physicians is to exchange accurate information on specialized cases (25). It is clear that these skills are closely associated with improved patient satisfaction (26). The establishment of communication networks among clinicians could significantly promote interpersonal communication, partnership, and cooperation of work groups (27). Given that there is a high number of physician visits in Iran, they have a little time for their patients and they do not talk about their clients together. This study sought to investigate the impact of establishing an advisory communication network of physicians on level of HbA1c and FBS in patients with diabetes in Iran. The present study was a single-blind, randomized, controlled clinical trial that was performed with patients, who had been diagnosed with type 2 diabetes and were treated at health centers over the past 5 years, aged 40 to 65 years. Considering type 1 error of 0.05 and power of 80%, and assuming 15% score difference before and after the intervention, 50 patients were calculated for each group using the following formula. In order to provide the sample, after receiving permission from the department of education, 12 health centers were randomly selected among the health centers of Mashhad, using the cluster sampling approach (followed by the simple random sampling method). The randomization was based on health centers and health centers were randomly assigned to intervention and control groups. These centers were governmental. The intervention group consisted of 6 health centers, in which all physicians were engaged in a communication network (the patients were randomly selected from a list of patients at health centers). The control groups consisted of patients of health centers, whose physicians were not engaged in the communication network (the patients were randomly selected from a list of patients in health centers). This study took place from 20/11/2015 to 15/1/2016 in both intervention and control groups, respectively. Patients, who were willing to participate in the study signed an informed written consent (Figure 1). The communication network included a family physician, an internist, and an endocrinologist. At the outset of the study, the physicians in the intervention groups were briefed in a session about the objectives of the study. Then, a communication network was established between physicians that allowed them to consult and exchange their ideas about their patients. The members could contact each other through phone, SMS, email, and weblogs. They could exchange views and personal experiences in relation to diabetes care. Moreover, 4 meetings were held during the period of study, in which the physicians discussed special cases and problems associated with the treatment of their patients. Prior to the intervention, HbA1C and FBS of patients in both intervention and control groups were measured. Blood samples were sent to the laboratory of Mashhad University of Medical Sciences. Given the fact that the minimum change of HbA1C could be measured after 4 months, the HbA1C and FBS variations were evaluated 4 months after the intervention. Data collection was performed only by the researcher. There were no missing values in the study. After collecting data, the researchers coded questionnaires and analyzed them using the SPSS 20 software. In the first step, the normality of quantitative variables was assessed by Kolmogorov-Smirnov test and data distribution was normal, thus parametric tests were used. For the analysis of the demographic characteristics, descriptive statistics, such as frequency distribution, mean and standard deviation and inferential statistics, including independent t-test, paired T-test, Mann-Whitney, Mcnemar, chi-square, and Pearson's correlation coefficient were used. In all tests, P-value < 0.05 was assumed statistically significant. This clinical trial was approved by the institutional ethics committee of Mashhad University of Medical Sciences, with the following code IR.MUMS.REC.1394.166. The Participants in this study filled out the informed consent form to participate in the study. The Participants were ensured about the confidentiality of test results and the caring and training measures of the control group were performed after the study. The study was also registered with code “IRCT2016061928529N1” in the Iranian Registry of Clinical Trial. The frequency distributions of demographic variables of patients with diabetes showed that 29 patients (29.0%) were males; 55% were in the age group of 51 to 60 years, 51% were literate, 72% were unemployed or housewives and the rest were employed. Moreover, 74% had a 5- to 10-year history of diabetes with the rest having diabetes for more than 10 years. Table 1 shows the demographic characteristics of the patients. aData are presented as No(%). In the intervention group, before and after the establishment of the communication network among physicians, a significant difference was observed in the level of HbA1C. After the development of the communication network, HbA1C levels had reduced in the intervention group. In addition, the paired t-test indicated a significant and reverse statistical difference in the HbA1C in the control group, with the HbA1C levels increasing in the control group (Table 2). To compare the effect of developing a communication network among family physicians on FBS in the control and intervention groups, this research used the results of independent t-test, which demonstrated significant differences in FBS variable after the establishment of the communication network (P < 0.001). This indicates the positive impact of communication networks, which is characterized by the exchange of information and experience between physicians participating in the study (Table 3). The results indicate the reduced mean of FBS and HbA1C after the establishment of the network among physicians in the intervention group. However, in the absence of this network in the control group, the mean FBS and HbA1C were increased. Abazari et al. (18) in a study entitled challenges of medical education in the prevention and control of diabetes in Iran showed that despite the important role of physicians in the management of diabetes in health centers, there are still serious shortcomings regarding their training. Such deficiencies could be attributed to unsystematic training (e.g. discontinued primary training of newly graduated doctors and the lack of re-training), lack of proficiency in all aspects of diabetes care among physicians (e.g. inadequate knowledge or failure in winning the trust of patients and colleagues), and barriers to effective education (e.g. planning challenge and insufficient monitoring of the medical education). The results of the study suggest that medical training with new methods, like the establishment of a communicative network in the workplace among physicians, could have a positive effect on reducing FBS and HbA1C in patients with diabetes. In different studies, the impact of communication networks between professionals on the safety, confidence, and self-care of patients have been shown (28, 29). The results of independent t-test in the intervention and control groups revealed that the HbA1C level had dropped in the intervention group after the establishment of the network among physicians, yet, it has increased in the control group. The results suggest that the coordination and sharing of information among physicians through a communication network could have a positive impact on enhanced quality of care and health of patients. The findings are consistent with the conclusion of Cunningham et al. (30), which showed that integrated communication networks among specialists could promote the coordination and quality of health care services to patients. Additionally, such networks could help identify weaknesses and shortcomings related to the healthcare provided to the patients. In this study, the decrease of HbA1C in the intervention group was statistically significant, yet this decrease was not substantial, which could be due to the short duration of the study (4 months). Other researches have shown that in a longer-term intervention, the reduction of HbA1C level would be considerable. Also, for greater reduction, more time should be dedicated for communication between physicians in order to control diabetes. This indicates the effect of communicative networks on reducing HbA1C level in patients under study. These findings are consistent with the study of Turner (31). In addition, the results of the study reveal the inadequate knowledge of physicians about the establishment of a communicative network and the knowledge of various medical groups, such as GPs, internal specialists, residents, and medical students, which had significant differences. The study of Kollmuss and Agyeman (32) indicates the key role of knowledge and awareness in determining the attitude and behavior of people. Thus, creating a communicative network among physicians based on an exchange of information about patients care and treatment methods could help overcome this deficiency. The strong point of this study was the novelty of the title. To the best of our knowledge, there is no other study about the effect of establishing a communication network of family physicians on level of HbA1c and FBS in patients with diabetes. The chief weakness of the study was the use of a self-reported questionnaire. In the course of this study, the researchers faced limitations, such as lack of HbA1C kit due to the high prices and reluctance of family physicians in training and treatment of patients. Attempts were made to overcome such limitations by granting rewards such as training certificates or vacation incentives. The successful control of diabetes in patients requires fostering a working relationship among physicians so that they could share information about diabetes and new treatment methods with their colleagues. The establishment of a conductive communication network between physicians in different regions could eliminate such weaknesses. This study provided evidences that the existence of a communication network among physicians for consulting on diabetes could control blood sugar and HbA1c in patients. Researchers, according to the positive results of this study, could suggest that the development of a permanent network in different areas could contribute to improved healthcare for all patients, particularly those with diabetes. Researchers, according to the positive results of this study, could suggest that the development of a permanent network in different areas may contribute to the improved healthcare for all patients, particularly those with diabetes. This paper was based on a Master's thesis and research project approved by Mashhad University of Medical Sciences (No: 911129). The researchers express their appreciation for the assistance and cooperation of the research deputy of Mashhad University of Medical Sciences, especially the director of the Health Center of Mashhad, and all healthcare personnel, who helped us throughout this study. Authors’ Contribution: Ali Vafaei Najar Design and implementation of the project, Hadi Tehrani Scientific monitoring of the project, Mohammad Vahedian-Shahroodi Analysis of data, Hossein Imamian Involvement in implemen-tation of project, Hamidreza Mohades Hakak Participation in writing the article. Conflict of Interests: The authors declared that they had no conflicts of interest. Funding and Support: No financial support was received for this study. 1. Mazloomy Mahmoodabad SS, Tehrani H, Gholian-Aval M, Gholami H, Nematy M. The effect of social class on the amount of salt intake in patients with hypertension. Blood Press. 2016;25(6):360-3. doi: 10.1080/08037051.2016.1179508. [PubMed: 27146368]. 2. Diabetes C, Complications Trial Research G, Nathan DM, Genuth S, Lachin J, Cleary P, et al. The effect of intensive treatment of diabetes on the development and progression of long-term complications in insulin-dependent diabetes mellitus. N Engl J Med. 1993;329(14):977-86. doi: 10.1056/NEJM199309303291401. [PubMed: 8366922]. 3. Baharvand-Ahmadi B, Bahmani M, Tajeddini P, Naghdi N, Rafieian-Kopaei M. An ethno-medicinal study of medicinal plants used for the treatment of diabetes. J Nephropathol. 2016;5(1):44-50. doi: 10.15171/jnp.2016.08. [PubMed: 27047810]. 4. Esteghamati A, Gouya MM, Abbasi M, Delavari A, Alikhani S, Alaedini F, et al. Prevalence of diabetes and impaired fasting glucose in the adult population of Iran: National Survey of Risk Factors for Non-Communicable Diseases of Iran. Diabetes Care. 2008;31(1):96-8. doi: 10.2337/dc07-0959. [PubMed: 17921357]. 5. Zeitler P, Hirst K, Copeland KC, El Ghormli L, Levitt Katz L, Levitsky LL, et al. HbA1c After a Short Period of Monotherapy With Metformin Identifies Durable Glycemic Control Among Adolescents With Type 2 Diabetes. Diabetes Care. 2015;38(12):2285-92. doi: 10.2337/dc15-0848. [PubMed: 26537182]. 6. Khoramdad M, Rahimi M, Cheraghi Z, Izadi 3,N, Alimohamadi Y, Firouzi A, et al. The effect of dairy products subgroups consumption on the risk of diabetes: A systematic review and meta-analysis. Iran Red Crescent Med J. 2016;19(3):42064. 7. Hallgren EA, McElfish PA, Rubon-Chutaro J. Barriers and opportunities: a community-based participatory research study of health beliefs related to diabetes in a US Marshallese community. Diabetes Educ. 2015;41(1):86-94. doi: 10.1177/0145721714559131. [PubMed: 25398722]. 8. Tehrani H, Majlessi F, Shojaeizadeh D, Sadeghi R, Hasani Kabootarkhani M. Applying Socioecological Model to Improve Women's Physical Activity: A Randomized Control Trial. Iran Red Crescent Med J. 2016;18(3):21072. doi: 10.5812/ircmj.21072. [PubMed: 27247781]. 9. Samadi Aidenloo N, Mehdizadeh A, Valizadeh N, Abbaszadeh M, Qarequran S, Khalkhali H. Optimal Glycemic and Hemoglobin A1c Thresholds for Diagnosing Diabetes Based on Prevalence of Retinopathy in an Iranian Population. Iran Red Crescent Med J. 2016;18(8):31254. doi: 10.5812/ircmj.31254. [PubMed: 27781118]. 10. Vinik AI, Vinik E. Prevention of the complications of diabetes. Am J Manag Care. 2003;9(3 Suppl):S63-80. quiz S81-4. [PubMed: 12653455]. 11. Baradaran-Seyed Z, Majdzadeh R. Evidence-based health care, past deeds at a glance, challenges and the future prospects in iran. Iran J Public Health. 2012;41(12):1-7. [PubMed: 23641384]. 12. Valinejadi A, Sadoughi F, Salehi M. Diabetes Knowledge Translation Status in Developing Countries: A Mixed Method Study Among Diabetes Researchers in Case of Iran. Int J Prev Med. 2016;7:33. doi: 10.4103/2008-7802.175992. [PubMed: 26955462]. 13. Fathi Ahmadsaraei N, Neshat Doost HT, Manshaee GHR, Nadi MA. The effectiveness of acceptance and commitment therapy on quality of life among patients with type 2 diabetes (effectiveness of acceptance and commitment therapy on patients’ quality of life). Iran J Health Educ Health Promot. 2016;4(1):31-9. 14. Dunstan DW, Zimmet PZ, Welborn TA, Cameron AJ, Shaw J, De Courten M, et al. The Australian diabetes, obesity and lifestyle study (AusDiab)-methods and response rates. Diabetes Res Clin Pract. 2002;57(2):119-29. 15. Harris SB, Leiter LA, Webster-Bogaert S, Van DM, O'Neill C. Teleconferenced educational detailing: diabetes education for primary care physicians. J Contin Educ Health Prof. 2005;25(2):87-97. doi: 10.1002/chp.13. [PubMed: 16078807]. 16. Norris SL, Nichols PJ, Caspersen CJ, Glasgow RE, Engelgau MM, Jack L, et al. The effectiveness of disease and case management for people with diabetes. A systematic review. Am J Prev Med. 2002;22(4 Suppl):15-38. [PubMed: 11985933]. 17. Khoundabi B, Kazemnejad A, Mansourian M, Faghihimani E. Factors Associated With Serum Albumin in Diabetes Mellitus Type 2 With Microalbuminuria Using Non-Normal Mixed Models: A Prospective Cohort Study. Iran Red Crescent Med J. 2016;18(1):20671. doi: 10.5812/ircmj.20671. [PubMed: 26889385]. 18. Abazari P, Vanaki Z, Mohammade I, Amini M. Challenges of physicians’ training program on diabetes prevention and control. Iran J Med Educ. 2012;12(1):19-32. 19. Goodarzi M, Javadi Bora MA, Farajollahi M. Impact of education via mobile phone on knowledge, attitude, practice and hba1c of patients with type 2 diabetes mellitus in Karaj-Iran. Interdiscip J Virtual Learn Med Sci. 2015;6(3):8-19. 20. Funnell MM, Brown TL, Childs BP, Haas LB, Hosey GM, Jensen B, et al. National standards for diabetes self-management education. Diabetes Care. 2009;32 Suppl 1:S87-94. doi: 10.2337/dc09-S087. [PubMed: 19118294]. 21. Schillinger D, Bindman A, Wang F, Stewart A, Piette J. Functional health literacy and the quality of physician-patient communication among diabetes patients. Patient Educ Couns. 2004;52(3):315-23. doi: 10.1016/S0738-3991(03)00107-1. [PubMed: 14998602]. 22. Stewart MA. Effective physician-patient communication and health outcomes: a review. CMAJ. 1995;152(9):1423-33. [PubMed: 7728691]. 23. Varpio L, Hall P, Lingard L, Schryer CF. Interprofessional communication and medical error: a reframing of research questions and approaches. Acad Med. 2008;83(10 Suppl):S76-81. doi: 10.1097/ACM.0b013e318183e67b. [PubMed: 18820507]. 24. Wagner EH. The role of patient care teams in chronic disease management. BMJ. 2000;320(7234):569-72. [PubMed: 10688568]. 25. Harwood J, Sparks L. Social identity and health: an intergroup communication approach to cancer. Health Commun. 2003;15(2):145-59. doi: 10.1207/S15327027HC1502_3. [PubMed: 12742766]. 26. Meterko M, Mohr DC, Young GJ. Teamwork culture and patient satisfaction in hospitals. Med Care. 2004;42(5):492-8. [PubMed: 15083111]. 27. Bellur S, Sundar SS. Talking health with a machine: How does message interactivity affect attitudes and cognitions?. Hum Commun Res. 2016. 28. Effken JA, Gephart SM, Brewer BB, Carley KM. Using *ORA, a network analysis tool, to assess the relationship of handoffs to quality and safety outcomes. Comput Inform Nurs. 2013;31(1):36-44. doi: 10.1097/NXN.0b013e3182701082. [PubMed: 23114394]. 29. Sutcliffe P, Martin S, Sturt J, Powell J, Griffiths F, Adams A, et al. Systematic review of communication technologies to promote access and engagement of young people with diabetes into healthcare. BMC Endocr Disord. 2011;11:1. doi: 10.1186/1472-6823-11-1. [PubMed: 21210964]. 30. Cunningham FC, Ranmuthugala G, Plumb J, Georgiou A, Westbrook JI, Braithwaite J. Health professional networks as a vector for improving healthcare quality and safety: a systematic review. BMJ Qual Saf. 2012;21(3):239-49. doi: 10.1136/bmjqs-2011-000187. [PubMed: 22129933]. 31. Turner JW, Robinson JD, Tian Y, Neustadtl A, Angelus P, Russell M, et al. Can messages make a difference? The association between e-mail messages and health outcomes in diabetes patients. Hum Commun Res. 2013;39(2):252-68. 32. Kollmuss A, Agyeman J. Mind the gap: Why do people act environmentally and what are the barriers to pro-environmental behavior?. Environ Educ Res. 2002;8(3):239-60.